BRUSSELS, May 24 (Xinhua) -- Amid a nose-dive of intimacy in trans-Atlantic relations, the United States and the European Union (EU) are set to show their hands in seven days to end or extend their heartbroken negotiation for EU's permanent steel and aluminum tariffs exemption. The deadline, set by U.S. President Donald Trump on April 30, granted EU member countries "a final 30 days" till June 1 for further discussion. Described by EU leaders as "the Sword of Damocles" or "gun pointing to head," the deadline, together with Trump administration's unyielding stance, has exerted massive pressure on the EU. In the "game of chicken," as some European analysts called it, EU countries are forced to forge a united front and abandon pipe dreams on America. But the effectiveness of their solidarity still waits to be tested, given their divergences and Washington's unsatisfied appetite. With seven days to go, the EU found its offer to the United States "not enough" to end the trade row. "With friends like that who needs enemies?" said Donald Tusk, president of the European Council while commenting on the latest decisions of Trump.He then ironically called on Europe to be grateful to Trump "because thanks to him we have got rid of all illusions." 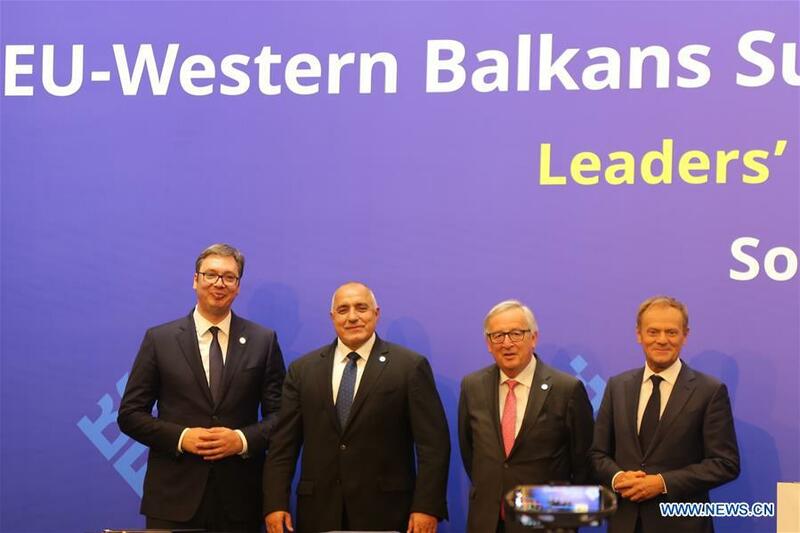 "He has made us realize that if you need a helping hand, you will find one at the end of your arm ... what we need is more political unity and determination," the president said at last week's EU-Western Balkans summit, where the EU made a four-point proposal in exchange for unlimited exemption from the United States. The proposal includes deepening energy cooperation, notably on liquefied natural gas (LNG), focusing on voluntary cooperation between regulators on both sides on an ad hoc basis, working together on WTO reform and discussing ways to improve reciprocal market access for products like cars. The proposal shows that "we are not negotiating anything under threat but that we are willing to engage on a positive agenda if we were excluded from these measures (tariffs)," said EU Trade Commissioner Cecilia Malmstrom on Tuesday. Daniel Gros, director of the Center for European Policy Studies, a EU think tank, warned of obstacles in finding a deal. "On LNG, the U.S. and the EU might have common interests, but exports to the EU are starting anyway and the real aim of the U.S. is to get the EU (to) buy less from Russia. Unfortunately the EU institution can do very little about this as this is a decision of private companies and Russian gas is still cheaper than U.S. LNG," he said. HOW COME THE GUN IS POINTED AT EU'S HEAD? "It is evident that Trump implements an odd political strategy of force in his negotiations around the world. He makes a strong start trying to accomplish some of the goals that he has set," Panagiotis Petrakis, professor in the Department of Economics at the National and Kapodistrian University of Athens, told Xinhua. Echoing Petrakis, Constantinos Filis, director of research at the Institute of International Relations of Panteion University in Athens, said "Trump has applied his business logic in making key U.S. decisions on a number of issues: strike first to shape the negotiating framework and then force or impose (them) on other parties." "The problem here, however, is that this tactic doesn't differentiate between allies and competitors. As a result, the rift in the western camp now appears to be a real threat, thanks to Washington's unilateral actions," said Filis. These rifts, according to German Economic Minister Peter Altmaier, were unleashed by Trump's "America First" doctrine. "If you fight fire with fire, all you are left with is burned earth," Altmaier warned. Fredrik Erixon, director of the European Center for International Political Economy, put it more frankly. "The U.S. wants the EU to voluntarily reduce some of its steel exports, but the EU is having none of that. The U.S. ... (is) also using the threat of steel tariffs to get the EU to become more accepting of other U.S. wishes for the EU, like reducing tariffs in the auto sector," Erixon told Xinhua. WILL IT END IN HARMONY? Compared with the United States, the EU is more vulnerable in a trade war, said Fabio Parenti, associate professor of economic and political geography at the Italian International Institute Lorenzo de' Medici. "If we look at the trade tensions between USA and China, now on hold, it seems that Europe will be more affected for a simple reason: the main European countries are significantly more dependent on trade," said the professor. In addition, different levels of dependence on trade among EU members also brew divergences. "In the framework of the European Union, Germany was therefore attempting to reach 'sensible solutions' in ongoing discussions with U.S. representatives. However, unlike Germany, France is less likely to identify a compromise path with the U.S.," Theoxaris Grigoriadis, assistant professor of Free University of Berlin, told Xinhua. "Probably the EU will agree on 'voluntary ' export restraints. This is convenient for EU producers and for the U.S.," said Gros. Unlike Gros' optimism, Erixon told Xinhua that "this is all about politics. Both sides don't want to have a tariff war with each other, but neither side is willing to back down." However, if the uncertainty continues, it could be bad for everyone, he warned. "While the issue itself, the steel and aluminum tariffs, is a small one in transatlantic trade, let alone global trade, they can trigger bigger actions and they are a harbinger of forthcoming frictions in U.S.-EU relations," he concluded.